1. Select a backpack with well-padded shoulder straps to help protect the shoulders and neck. These straps should be adjusted so the pack fits snugly against your back. A pack hanging loosely from the back can pull you backward and strain muscles. 2. Consider a backpack with a waist belt to help distribute the weight of the pack evenly. Make sure that the backpack that you choose has hip belts and tightening straps, and go to a camping gear store to take a look at the backpacks and get more information on them. Whichever type of backpack you choose, make sure that it has a hip belt. What most people don’t know is that your hips can carry more weight than your shoulders, thus taking a lot of weight off your back. Another must for any backpack is that it has to have tightening straps. The straps are used to take off stress from parts of your back and redirect it elsewhere. 3. Select a smaller backpack for you if you are too young. The backpack itself should be light in weight. Consider buying a backpack on wheels, similar to the carry-on valise used by airplane travelers. Caution: These carriers are not for everyone, as they are difficult to maneuver in snow, and up and down stairs. Some schools don't allow them. 4. 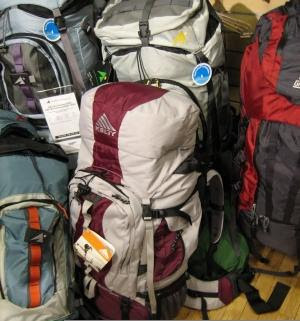 Don’t buy a big backpack: anywhere from 5000 to 6000 cubic inches is large enough. A child should not carry a backpack that weighs more than 15% of their body weight. For example, if a child weighs 100 lbs, their backpack should not weigh more than 15lbs. One thing that I cannot stress enough is to go to the store and try on backpacks. You need to be able to see how it feels and to look at the seaming on it. Just go to a camping gear store (such as REI), try on the backpacks and get some more advice from the helpers at the store. If the prices are too high for you at the store, remember the brand and type of backpack that you looked at and check the prices on the internet.